Deliver worry free bike storage with the exceptional Bike File, specialized specifically to provide secure, high density—user friendly bike storage. Capable of holding up to 9 and 18 bicycles, the 8' modular Bike File is designed with state-of-the-art trolley hanger arms, 1" pegs and U-Lock compatibility. 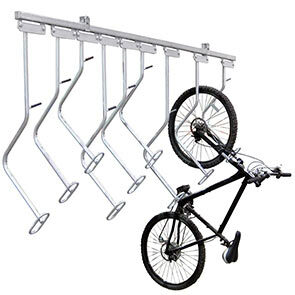 The sturdy trolley hanger arms slide back and forth—this allows for easy access for loading or unloading bicycles. Ideal for indoor bike security, the floor, wall or ceiling mounted Bike File is a reliable addition for facilities with limited storage space. Expand storage capacity at any time with modular add units.